Last night, I had a dream that I was at the dorm for the Heartbreak Hill Half & Festival, and while I was there, Nathan called me to ask if I was planning on showing up for our run. I said, "Oh crap, I forgot! I'll be right there!" and then I got distracted. I called him an hour later, and he told me that he'd already run five miles without me, so I could just forget about it. I felt awful in my dream. Then, I woke up. I was so relieved that it had just been a dream, because it made me feel so stressed for some reason. I glanced at the clock, and it was 6:15 AM. I was supposed to meet Nathan at the State Park at 6:15 AM. My stupid phone had shut off for some reason during the night, and I was using it for an alarm at 5:50, so I obviously didn't get that alarm. I flew out of bed in a panic, ran around the house looking for a phone to call Nathan (my cell was still taking its good old time turning back on). I called Nathan and told him I was leaving right then, and he said that was fine, because he had gotten out of work about 10 minutes late. I threw on some clothes and ran out the door. I ended up getting there just after 6:30. Usually, I am the queen of being on time, or even early, so this made me a little crazy. Thankfully, my brother is super laid-back, and didn't mind at all. We ended up running the three-mile loop around the park. I hadn't run with Nathan in a couple of weeks, so it was nice to catch up. He's thinking about a goal race for the fall. 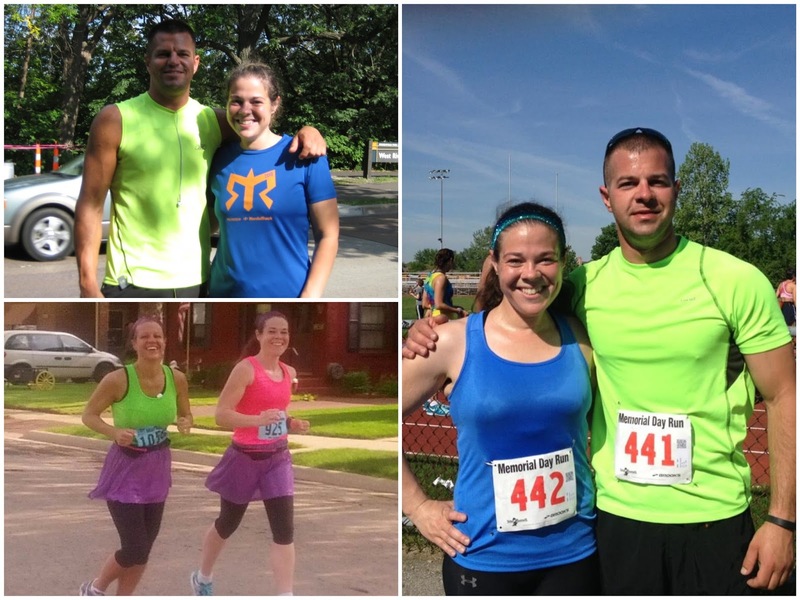 When I was going through race pictures for yesterday's post, I realized that I've done a race with all three of my siblings at some point, but not all at the same time. But still no race with all four of us! I love that we are all runners now, especially because none of us ran when we were kids. Brian took it up in 2005-ish(?) because he said that he loved his ice cream, and as he got older, he would either have to give up the ice cream or start running. Sound familiar? ;) I started next, and that was in 2010. Then Jeanie followed in 2012. And Nathan, in 2013. 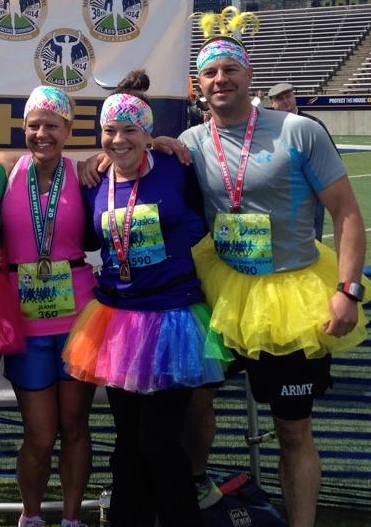 I think it would be so fun to do a "family Ragnar" or another sort of race together. Anyway, my run with Nathan was good. It felt hard, but that's nothing new for 96% humidity! Dang, check out that elevation gain. The State Park is a tough course, what can I say?! In my rush to get out the door, I forgot my heart rate monitor, so the calories burned are wrong. I wish I burned that many during a three-miler! Today was the kids' last day of school. Finally! It feels kind of strange to have such a short summer vacation, because they went to school for an extra two weeks. I signed the kids up for a couple of day camps--basketball and football, which they did last year and loved them. They're only three days each, for two hours a day. We don't have any major plans until the end of August when we go to Punta Cana. I'm hoping to have a relaxing summer, without too much stress, and maybe even get back down to my goal weight before our vacation. My weight hasn't budged much at all for months now (hanging on in the 147-149 range). I'll start doing my Wednesday Weigh-ins again when something actually happens. I know what I need to change, but this year has just been extra tough for me. Talking about it with Heather during the interview for her Half Size Me podcast was actually kind of therapeutic, and it made me realize some things that I hadn't thought of before. I'm hoping that after this (the difficult time I'm having) passes, I'll look back and say, "Yeah, 2014 was a tough year for my weight maintenance, but I stuck it out, and now I'm back where I need to be." Sometimes that's all I need to do--remind myself that some days/months/years will be harder than others, but it's pretty much a fact of life. Compared to 2014, I feel like I skated right through 2013 (well, until Mark's cancer diagnosis, anyway). That's what I like about your blog, Katie. You recognize that you would like to change something, you make a plan to do it, then you follow through. Even through the rough spots. I know you had a very tough year, but you handled it all with grace. Your elevation change cracks me up. I get 4 flights on my fitbit just going up my driveway and into my front door. I'm still working on the follow-through, but thank you ;) Yeah, we don't have much elevation change around here at all! Yes, a Ragnar would be a blast--hard to coordinate with everyone's schedules, but maybe in 2015 sometime! You have a very inspiring blog. I just started running a few weeks back and found your blog some time back. I am reading it frequently but commenting today first time. I hope i'll be a runner like you one day. Thanks for reading (and commenting)! I never imagined I'd be a runner someday. You can do it! I have three sisters and have been thinking about the four of us doing some racing event together. I think marathon relays are usually 5 legs so that wouldn't work unless I was able to run two legs. 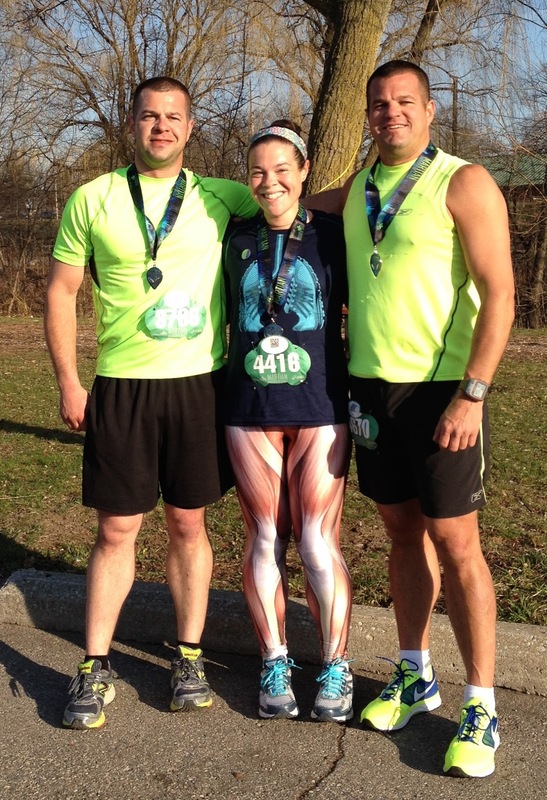 (I'm the only regular, year-round runner) I am going to bring it up next month when I will be seeing two of my sisters.